The wheat trials in this chapter aim to help farmers decide whether they can reduce their costs of seed and weed control through adjustment of seed rate, and if their yields can be increased through improved seeding methods. The on-farm trials use techniques to determine optimum plant population for the farm. Comparisons indicate gross returns from contract drilling could commonly double those from the farmers broadcasting approaches. For background reading refer to companion chapters from this series on tillage, optimizing crop sequences, optimizing variety and sowing date, and to the introductory chapters Constraints to cereal-based rainfed cropping in Mediterranean environments and methods to measure and minimize their effects and Why do any of your research on-farm? for general harvesting methods and data analysis. Which farms could benefit from these trials? those farms that predominantly use semi-dwarf varieties with short coleoptiles and experience poor establishment, slow early growth and weed competition. they produce the optimum number of competitive plants for the land. Farmers need to know what seed rate they should use under their conditions. They also need to know how soil type, sowing practice and weather influence crop establishment and plant population. The best seed rate is that which maximizes grain yield. In practice grain yield hardly changes with further increases in seed rate once maximum yield is reached (see how the curves flatten at high seed rates in the figure). Seed sown above that needed to reach the flat part of the curve, is money wasted. Due to the flatness of the curves near maximum yield, it is difficult to estimate the optimum seed rate from a relationship such as in the figure. A better approach is to work from the relative cash values of seed for sowing and seed to sell as grain. This might be around a ratio of 5:1 i.e. the cost of quality seed is five times the value of grain produced. Thus, the optimum seed rate is the point on the response curve of the figure when an extra 1 kg ha-1 of seed sown results in an extra 5 kg ha-1 of grain yield. The calculated optimum seed rates for drilled and broadcast crops are shown as arrows in the figure. The relationships will depend on the percentage of sown seed that leads to healthy established plants. Under the best conditions, farmers can expect 55-65 percent seeds will establish on hard-setting clay soils and upto 90 percent on sandy-surfaced soils. However, at higher seed rates (>100 kg ha-1 for drilled crops) and under any soil conditions, establishment falls to about half those values. For broadcast sowing, very poor establishment percentages are common, often falling below 50 percent. Part of this is due to rough seedbeds, poor seed covering and poor contact between seed and moist soil. Additionally, where seed is hand harvested and stored on-farms, quality can be poor because of storage at high temperature and moisture. Sticks, stones and weed seeds reduce quality further. With such poor seed, farmers have to use very high seed rates to obtain adequate plant populations. 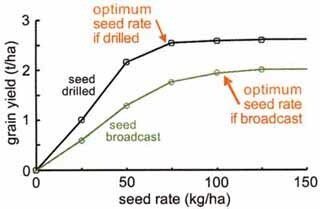 The optimum seed rate for broadcast crops can be twice that for drill-sown crops. Maximum yield in broadcast crops is also likely to be lower. This in part is because applied fertilizer is mixed through the soil rather than placed near the seed as in drilling, so is less directly accessible to plant roots. Furthermore, if the farmer broadcasts poor quality seed, the yield is likely to be even less than the lower line in the figure. If the seed rate used is above the optimum, a small cost is incurred for that extra seed, but if the rate is too low, yield may be reduced and the economic loss to the farmer is likely to be much greater. Seed rate or plant population? The number of plants established from a given weight of seed depends on the size of the seeds and the percentage of those seeds that are viable and can grow into established plants. The common range of wheat seed size is 25 to 50 mg and crop establishment varies between 40 and 95percent of sown seeds depending on soil type, soil moisture, sowing depth, seed quality, diseases and insects. Considering these variables a seed rate of 100 kg ha-1 could result in an established plant population that may vary up to threefold even in a drill sown crop. 100 kg ha-1 sown x 60 percent established/50 mg seed size = 120 plants m-2. In a drill-sown crop, establishment in farmers fields will be 10-20 percent less than in ideal conditions (10 percent less in good field conditions, 20 percent less in rough or dry seed beds). As a further complication, the establishment percentage in a drilled crop also decreases as seed rate increases. This is because seedlings get closer and closer together in the row and compete more for resources (see figure). Under ideal soil conditions establishment will be about 95 percent at a seed rate of 30 kg ha-1, 80 percent if a 60 kg ha-1 seed rate is used and 60 percent if rates are 90 kg ha-1 or more. 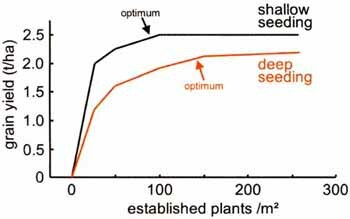 Where seed is broadcast, the seedlings are not spaced as closely together as when drilled, so there is less competition between them at high seed rates during establishment. The main problem with broadcast systems is poor seed quality and poor seed-to-soil contact. You can estimate average seed size by counting and weighing a sample of the seed lot then dividing the weight by the number. Establishment percentage can be estimated through a germination test described later. If the crop gets off to a poor start it seldom recovers to reach its yield potential. Consequently, seed for sowing should be of the highest quality. It should be of even size (graded if possible) and plump, free from rubbish (sticks, stones, etc. ), free from weeds and from crop seeds damaged by disease or frost. Seeds stored at temperatures above 30 °C or at moisture contents greater than 12 percent are likely to have reduced vigour and, if stored for more than one season, will have a germination percentage less than 50 percent. Given that no yield penalty is likely if the plant population exceeds the optimum for maximizing yield, farmers often use seed rates that result in higher populations than necessary as a means of competing with weeds. The aim of modifying plant population through trials is to find the minimum plant population that will not limit crop response to management inputs or seasonal conditions. The other aim is to save money. Plump seeds have high germination vigour, emerge quickly from the soil and have a competitive advantage over weeds. As a general rule, if weeds emerge before or at the same time as the crop, they severely reduce crop yield. However, if the crop emerges before the weeds, its yield is barely reduced by competition. Shrivelled wheat seeds, or seeds that experience drought or water logging during germination will develop slowly, produce fewer leaves and tillers, compete poorly with weeds, be more susceptible to damage from herbicides and yield less. The coleoptile is a sheath that covers and protects the first shooting leaf in cereal seedlings. 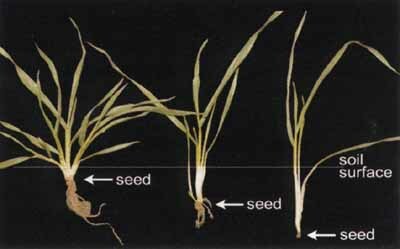 It extends from the seed during germination until it emerges at the soil surface. If the seed is sown too deep the coleoptile cannot reach the soil surface and the fragile shoot must push through the soil without protection. The shoot will often die before it emerges if not protected by the coleoptile. The final length of the coleoptile is less at high seedbed temperatures. Wheat varieties also vary in their inherent coleoptile length from as little as 35 mm to over 150 mm. Dwarf and semi-dwarf varieties tend to have shorter coleoptiles than tall varieties, though some modern semi-dwarf varieties have coleoptiles that exceed 60 mm. tilth for good soil-seed contact and sufficient soil moisture for quick germination no weeds present at sowing. rate not guessed but calculated according to seed size, target plant population and calculated establishment percent as detailed here. This study examines the impact of seeding method, seeding density, seedling vigour, weed competition and crop establishment on yield, to define the optimum plant population for the farm. The first step before deciding on treatments and a trial site is to discuss the reasons for the trial with the prospective collaborating farmer(s) and the likely benefits to productivity on the farm. The farmer will have clear practical opinions on how best to achieve any objectives and whether the trial will apply to the location. The trial should be carried out at an agreed point in the farmers cropping sequence, consensus should be reached about the costs involved, allocation of costs and responsibilities, and the ownership of the grain that is produced. As the trial is presented it is aimed primarily at drill-sown crops. Seed rates in broadcast crops are frequently set by factors that are not easily fine-tuned for economic yield. Commonly there will be no choice in quality of seed available and ways to improve yield by other means will be very limited. Where there is an opportunity to discuss broadcasting with collaborating farmers, start by looking at the gross returns analysis in the table. This shows that contract drilling (if available) could provide twice the profits of a broadcast crop. Ask farmers to supply real values so you can properly compare broadcasting and contract drilling. a There is a cost of storing seed on-farm and a cost associated with not having sold it as grain. b There is a cost associated with cultivation. If you include treatments using broadcasting, you could have seed quality (i.e. vigour) as subtreatments (seed stored correctly and incorrectly or use old contaminated seed). Maybe a farmer has some old seed for the trial. Seedling vigour in the drilled crops is varied experimentally by sowing either shallow or deep (say 50 and 100 mm but the range should copy local practice). Five target plant populations are recommended (e.g. 25, 50, 100, 200 and 400 plants m-2) to give enough data points to fit a curve to the results and determine optimum plant population accurately. Thus, there will be two depths, five target populations and three replications (blocks) making a total of 30 plots. Each five plots for population should be completely randomized within a sowing depth and the randomization redone for the three replicates. Use a local variety for the study. If a second locally adapted variety is available with a very different coleoptile length to the first, it can be usefully added to the study if resources allow. That will double the trial to a large 60 plots. If the area has major weed problems, propose as a possibility, a second or combined trial that aims to find the plant population needed to control those weeds and still achieve high yield. 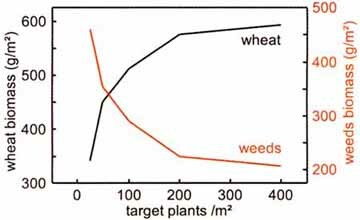 This study uses two levels of weed control (sprayed and not sprayed) and the same five target plant populations. To keep the combined trial to a more manageable 30 plots, a single variety and a single seeding depth can be used. Suggest repeating the trial for three seasons to provide trends of response to the environment and duplicating on different soil types if appropriate. Working on the farms of two or more collaborating farmers as a team will accelerate the collection of such information. Explain that the project hopes to conclude with the best solutions for a range of seasons and for the local region. A predetermined number of viable seeds is sown in each plot after measuring seed size (weight) and checking germination percentage. No chemical or hand weed control is allowed after sowing (except when the subtreatment of chemical weed control is added) so that the effect of seed vigour and plant population on weed growth can be assessed. If the trial compares broadcast with drill-sown treatments, the plots must be large enough to use the local broadcasting technique at sowing and to sow both treatments on the same day. If available, use a mechanical seeder that enables accurate control of sowing depth to sow the drill trial or sow by hand. Preferably locate the trial within the farmers normal crop and sow at the same time. This allows direct visual comparisons through the season and comparisons for yield at the end. The trial plots should be at least eight rows wide and at least 10 m long at sowing. At harvest the area sampled in each plot should be six rows × 8 m or similar. The basic design should have five plant populations and three replicates and use a local variety. Optionally, add weed control, sowing depth or a second variety as treatments. Row spacing should be what farmers normally use and can be 15 to 25 cm, but the choice must be known in advance so that the seed rate needed for each plot can be calculated. Basal N and K fertilizers, if used, should be separated from the seeds, but P fertilizers can be mixed with the seed if convenient. The seed should be treated immediately before sowing with standard rates of fungicide to control seed-borne diseases such as smuts and bunt. Leaf diseases and insect pests should be sprayed if they threaten the validity of the trial or if they are atypical for the region. Check out the site(s) with the farmers while the previous crop is still growing. Look for and mark good or bad areas that should be avoided when laying out the trial. The area planted to the trial should be uniform with no residual effects of any previous small plot trials or crop treatments. If there is no weather station nearby, put a rain gauge and max/min thermometer at the trial site or near the farmers dwelling for convenience. If the farmer makes the measurements and recordings, clarify that this should be weekly throughout the season, when instruments should be emptied or reset. Details of what is required are in the introductory chapters. Supply the farmer with a table in which to record the data. Explain the importance of being able to relate the trial results to seasonal conditions, particularly when the trial is repeated over several sites and seasons. Results may vary considerably depending on whether it was a hot, cool, dry or wet year. The aim is to be able to decide what agronomic techniques arising from the trial should be used in the average year. Describe the soil for the site(s) in textural classes (sand, silt, clay). If possible take topsoil and subsoil samples (0-10 and 40-50 cm depth) from up to 20 locations at the site(s) and have them analysed for pH, organic carbon and macronutrients. This initial description and analysis may be important for explaining different responses to treatments at different farms. Without soil and weather data it is always unwise to extrapolate conclusions from one location and season to another. Seed lots should be graded to remove weed seeds and inert material and to make the sample more uniform. Counting then weighing 10 random lots of 100 seeds per variety will accurately gauge average seed size. Test germination of cleaned seed at 20 °C preferably in a laboratory. A standard temperature for tests means that results can be compared regardless of when the tests were made, but measured and recorded room temperature is acceptable. Place seeds on a damp filter paper in a Petri dish or wrap them in a moistened germination towel or paper. They should not be allowed to dry out during the tests. Likely field establishment percentage can be estimated from the following table. Seed rate to be used for sowing can then be calculated using the following formula. For example: for a target population of 100 plants/m2 and using seed of average weight (35 mg) and a laboratory germination test of 95 percent. Seed rate = 100 x 35/90 or 39 kg ha-1 (check the first table for likely establishment percent). i.e = 39 kg ha-1 x 1 000 x 0.0016 ha. Plant counts should be taken at the same time each day every one or two days after seedlings begin to emerge. Counts should be taken at three places in each plot, avoiding the outside rows and the ends of the plots. One metre-long sections of row should be marked so that the same row sections are counted each day (these row sections will be used for other measurements later). In the case of broadcasted seed a square of 0.5 m2 at three locations in each plot can be used. 100 x 0.2 x 0.9 = 18 viable seeds per m of row. So if six seedlings are counted on day 5 the emergence percentage is 6/18 = 33 percent. The most relevant measure of seed vigour in the field is the speed of emergence. It is related to later crop development and growth. 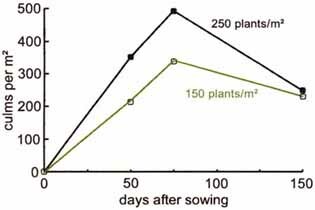 One way to estimate speed of emergence is to calculate the number of days to reach 50 percent emergence. An example for 100 plants/m2 (i.e. 18 seeds/m of row as in the example above) is shown in the table above. [(50-39)/(61-39)] + 7 = 7.5 days. Check these calculations from the table where relevant numbers are in red. Any shoots, whether main shoots or tillers, are included in the culm count at the beginning of stem elongation within the marked 1-metre sections of rows in each plot. Stem elongation is when the first node can be felt as a lump at the bottom of the main stem. This is when culm number reaches its maximum. These counts will be used to assess plant vigour. More culms equate with more vigour, more leaf area, higher biomass production and better weed control. Estimate biomass by taking cuts to soil level at critical growth stages such as the end of tillering (when culm number is counted), at anthesis and at maturity. Take the cuts (1 m of row per plot) near the marked 1-metre sections of row in each plot but not from the adjacent rows. Preferably dry your samples to constant weight in an oven at 50-70 °C. If drying ovens are not available, air-drying can be achieved by loosening and spreading samples out under cover, such as in a dry greenhouse. Change in biomass with advance of crop development reflects the ongoing responses of the crop to its treatments so staged biomass measurements can show when particular things occurred. However, omit the measurements at tillering and anthesis if resources are not available. Do not miss the measurements at maturity. They are critical. An analysis of yield components is time consuming but it can explain why things happened. For example, if ears are small, stress or competition from weeds occurred early in growth when number of spikelets is determined. If grains are small the stress occurred at the end of the season during grain filling (check the introductory chapters for patterns of development in wheat and when parts of the plant are fixed). Yield components can be estimated by cutting marked plot sections just before maturity harvest. Total biomass, ear number, sample grain weight and kernel weight should be determined from this sample. Harvest index (grain weight as a percentage of total biomass), average ear weight, and average kernel number per ear can then be calculated. Grain yield is best measured from a mechanical or hand harvest of each whole plot after discarding the outside rows and the outer one metre on the ends of the plot. If you have made several cuts for biomass during the season, avoid those areas in each plot and cut an untouched area for final yield. Make that area as large as practicable. Measure its area. If you have the resources, measure grain test weight (weight per unit volume in kg/hl) and small grain sievings (using a 2 mm slotted sieve) on a subsample of grain from the whole plot. These values are related to the yield of flour that can be milled from the grain. Cuts of weeds should be taken from at least two measured areas (0.5 or 1 m2) in each plot once the crop has finished flowering. Select areas of average weed infestation. Separate the cut weeds into grasses and broadleaves and if possible record their species names before drying and weighing. Grass weeds can be much more damaging to cereal crops since they compete more strongly for nitrogen and can carry root diseases and pests that also attack cereals. Calculate dry weight on an assessed unit area basis (per m2 as for the crop). If you are familiar with analysis of variance, use it to indicate which main effects and interactions are significant at the 5percent level of probability. The optimum plant population can then be calculated for any of the significant interactions with plant population. The example analysis assumes you have included two varieties in your studies. In the example the interaction of depth x population is significant but that of variety x population is not. 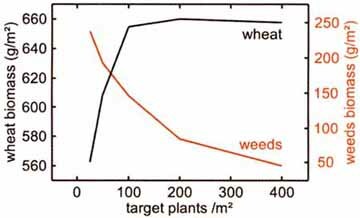 Hence it is statistically correct to fit curves to the plant population responses at each sowing depth using the means of the two varieties. A quadratic equation is satisfactory. The optimum plant population can then be estimated as the point at which an extra three plants/m2 (equivalent to approximately 1 kg ha-1 of seed) results in an extra 5 kg ha-1 of yield. This is an arbitrary rule as explained earlier. A different criterion can be used so long as the same rule is used for all sets of treatments. In this example the D x P interaction is significant so it is statistically correct to discuss the results for the interaction and not the results for the main effects of D and Pseparately. In any case, the main focus of this trial is the effect of depth and variety on optimum plant population. As variety effects were not significant the depth and population data will be discussed using the mean of the two varieties as in the example in the table. Does sowing depth affect yield? When seeds were drilled deeper in the example trial shown in the table below, yield was always less at equivalent sowing densities. When 50 seeds per m2 were sown for example, yield was reduced by almost 30 percent. The maximum yield that could be achieved irrespective of numbers of seeds sown was also less from deeper planting, down by around 12 percent (2.51 to 2.20 t ha-1). In fact, the number of seeds to plant from depth to achieve the number of established plants for optimum yield was virtually double that from shallow seeding. Put simply, many more seeds need to be planted, if they are planted deeply, to produce the best yield (see the figure). When showing the results of your cooperative trial to farmers, discuss not only your equivalent to the above figure but also how to work out from your table the equivalent increase in grain yield for each increase in seed rate. 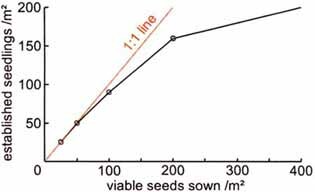 Seeing the increments in grain yield for the increments in seed sown will be more persuasive than a graph, though the graph is vital for exact calculation of optimum seed rate. For example, in the table for the 50 mm sowing depth, increasing plant population from 50 to 100 plants/m2 took an additional 19 kg seed ha-1 but gave 240 kg ha-1 more yield (a 12-fold benefit for the extra seed). However, increasing from 100 to 200 plants/m2 took an additional 40 kg seed ha-1 but gave only 20 kg ha-1 more yield. Superficially this last increment was an economic loss. However, then you have to consider together what the effect of that additional population was on weed growth. Together you may conclude from your data that 40 kg seed ha-1 is a cheap means of weed control. Now look at the following pair of figures showing that increasing plant population of wheat has very much decreased the growth of weeds, but more so when the crop was sown shallowly. If you examine your tiller counts they will also show that crop plants when sown shallowly are better competitors with weeds. This is because they emerge more quickly and tiller earlier (see the sowing depth photo). However, farmers often use seed rates that result in plant populations that far exceed the level required for maximum yield. This may be a conscious use of extra plants to assist in smothering weeds and may be an economically viable solution where herbicides are unavailable or not favoured. Some farmers may be concerned that increasing the seed rate will increase the proportion of small grain sievings (passing a 2 mm slotted screen) or decrease the test weight (kg hl-1) of the grain, and that the value of the grain will be reduced. Both measures are related to the yield of flour that can be obtained from a given weight of grain, an important consideration for farmers who use their grain to make flour for their own consumption. Seed harvested in your trial should be examined to check the levels of these grain defects against locally relevant standards (international standards are <5 percent for small grains and >74kg hl-1 for bread wheat). When discussing this type of trial with local farmers you must consider their attitudes to sowing practice and seed rate. For example, the farmer may not be prepared to sow shallowly for fear of losing seed in seasons when the early rains fail. The use of a variety with a very long coleoptile may then be a more acceptable option, even if some yield is lost in good seasons. Make some measurements of plant populations in nearby farmers fields. Assuming your trial actually demonstrates improvements in economic yield, use the contrast in populations to strengthen your arguments for changed practice. In the example, sowing at 100 mm depth compared to 50 mm reduced crop establishment, increased the plant population required to reach the maximum grain yield, reduced the maximum grain yield level itself, and reduced the ability of the crop to suppress weed growth. It cannot be concluded that this result is generally applicable to all rainfed wheat crops, since factors such as soil water, soil temperature, soil texture, weed species and crop varieties can all influence the result. If the results of this trial are supported by other results in the region suggest that farmers try to control sowing depth to about 50mm and that a target plant population of between 100 and 200 plants/m2 will considerably assist in suppressing weeds. Substantial savings in costs of seed and weed control should result, as well as grain yield increasing. Supplementary trials may be required to test the effects of the main variables in the region on your crop establishment package. Typical critical variables are rainfall, temperature and soil type. To see how these will affect your proposed package, run the trial on farms over several seasons, refining it as you go in light of the results, new varieties, and discussions with farmers. With time, a suite of optimized packages can be compiled that will cover the main requirements of all the farms in your region. Anderson, W.K. 1986. Some relationships between plant population, yield components and grain yield of wheat in a Mediterranean environment. Australian Journal of Agricultural Research 37, 219-233. Anderson, W.K. & Impiglia, A. 2002. Management of dryland wheat. In B.C. Curtis, S. Rajaram & H. Gómez-Macpherson, eds. Bread wheat: improvement and production, pp. 407-432. FAO, Plant Production and Protection Series 30, Rome. Fawcett, R.G. 1964. Effect of certain conditions on yield of crop plants Nature 204, 858-860. Puckridge, D.W. & Donald, C.M. 1967. Competition among wheat plants sown at a wide range of densities Australian Journal of Agricultural Research 18, 193-211. Shackley, B.J. 2000. Crop management. In W.K. Anderson & J.R. Garlinge, eds. The Wheat Book -principles and practice, pp. 137-145. Agriculture Western Australia, Bulletin 4443. Australia.